ON-SITE has maintained a strong position in the construction industry through its Quality Assurance inspection of both fabricated and erected structural steel as they relate to High-Rise, Single Story, Pre-Engineered Buildings, Sports Complexes, Exposition Centers, and Large Bridge Spans. 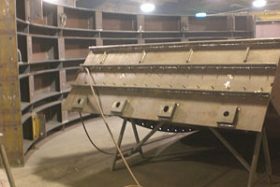 Special steel fabrications for Dams, such as large radial gates, fish screens, crane and hoisting equipment, penstocks are in our catalog of successfully completed inspection assignments. ON-SITE routinely provides inspection during fabrication and erection of Structural Steel Bridges of varying type, size and complexity. Among the types of bridges we have provided Quality Assurance inspection includes Plate Girder, Box Girder, Truss, Pre-Stressed Concrete structures, Arch and Cable Stayed. Our staff is equally experienced in the inspection of Pilings, Bearings, Overhead Sign Structure’s, Lighting Standards, Guard Rails and Expansion joints. To illustrate our contemporary experience with the provision of quality assurance services associated with the fabrication and erection of structural steel ON-SITE presents the following Project Profile capsules of current projects and previous project experience. 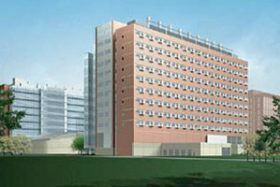 The UCHSC Research II Project will be the second major research facility at the Fitzsimons / University of Colorado Health Sciences Center. 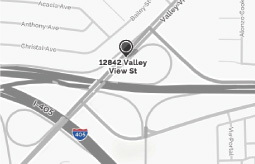 The building will be interconnected to the adjacent Research Complex I via bridge and underground tunnel, and possibly connected to a planned office complex. 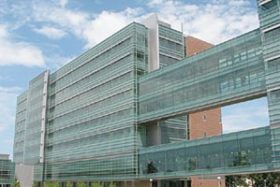 The project consists of the fabrication inspection and erection of a 506,000 SQFT Research Complex, to include wet laboratories, core laboratory space, lab support, related faculty offices and conference rooms, animal research space and building support space. It is two structures are connected by the education bridge, providing educational space on the lower floors and faculty offices on the upper floors. The $205.8 million dollar project consisted of the fabrication and erection of the structural steel associated with the construction of this complex. ON-SITE provided fabrication inspection of the structural steel at 4 separate manufactures facilities simultaneous at locations throughout Kansas, Oklahoma, Texas and Mexico utilizing local area inspectors. 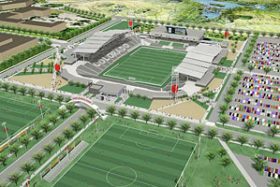 The Colorado Rapids Soccer Stadium and Sports Park consists of the fabrication inspection and erection of a 600,000 SQFT sports complex that will seat over 18,000 soccer fans. 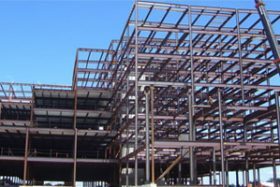 The project consisted of the fabrication and coating inspection of the structural steel associated with the construction of this complex. ON-SITE provided fabrication inspection of the structural steel at 3 separate manufactures facilities simultaneous at locations throughout Arkansas and Nebraska utilizing local area inspectors. The UCHSC Education II Project consists of the fabrication inspection and erection of a 275,376 SQFT Educational Complex, which includes the Education Bridge and Academic offices. It is two structures, connected by the education bridge, providing educational space on the lower floors and faculty offices on the upper floors. The $75.5 million dollar project consisted of the fabrication and erection of the structural steel associated with the construction of this complex. ON-SITE provided fabrication inspection of the structural steel at 2 separate manufactures facilities simultaneous at locations throughout Arkansas and Oklahoma utilizing local area inspectors. The Van Nuys Air Operations Center consists of the fabrication inspection and erection of (3) separate 50,000 SQFT aircraft hangers that will be utilized by the GSD, LAPD and LAFD. The project consisted of the fabrication and coating inspection of the structural steel associated with the construction of the hangers. 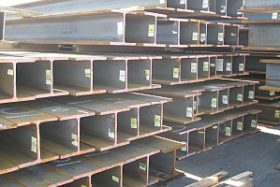 ON-SITE provided fabrication inspection of girders, roof joists, security doors and coatings applied to the steel at manufactures located in the United States and Mexico. The Northwest Area Police Station consists of the fabrication inspection of the structural steel associated with this new state-of-the-art police station. The 54,000 SQFT two story structure will house commanding officers’ offices and community relations offices. The five and a half acre site will feature a vehicle maintenance facility and a secured parking structure for employees and Department vehicles. 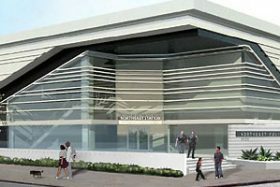 The Rampart Replacement Police Station consists of the fabrication inspection of the structural steel associated with this new state-of-the-art police station. The 50,000 SQFT building includes commanding officers’ offices, holding cells and management offices. 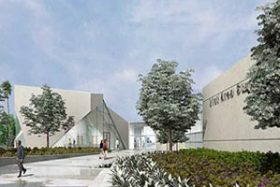 The New Northeast Area Los Angeles Police Station facility will replace the existing police station located on the site in the community of Glassell Park. The construction of a new two story, approximately 54,000 square foot Police Station, 180 feet high communication tower, partial demolition, and reconfiguration of the existing police station including the tenant improvements of the remaining portion of the building. This $22.5M multi-level 60,000 SF structural steel frame structure will feature blast-proof facades and seven holding cells. The exterior will feature several finishes including metal panels and curtain wall. ON-SITE provided fabrication inspection of the structural steel and composite metal panels associated with this new state-of-the-art police station. The LAPD Metro Division Los Angeles Police Station facility consists of the complete renovation of the LAPD Metropolitan Division Police Facility (formerly Old Rampart Area Police Station). 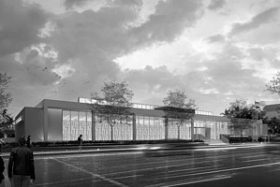 This $14.5M project includes the demolition, architectural, civil, landscape, structural, mechanical, electrical (including aboveground fuel tank and monitoring system for the emergency generator), plumbing, communication, photovoltaics and security systems. 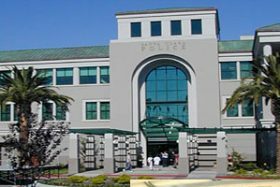 ON-SITE provided fabrication inspection of the structural steel, security gates and composite metal panels associated with this new state-of-the-art police station at locations throughout the U.S. and Canada. Performing in process welding inspection of the welded steel for the new 60,000 SQFT Multi story structural steel terminal expansion involving fracture critical steel inspections and specialty NDE performed during fabrication inspection. 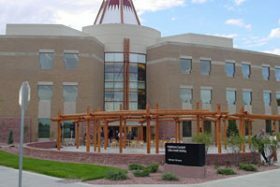 The UCHSC Nighthorse Campbell Native Health Building has Native American cultural elements integrated into its design and houses one of the nation’s most advanced American Indian and Alaska Native health care programs. The $12.2 million dollar three-story, 46,000-square-foot building project consisted of the fabrication of the structural steel associated with the construction of this complex. ON-SITE management personnel provided direct management of fabrication inspection personnel of the structural steel associated with this project at manufactures located in Montana. The UCHSC Research Complex 1 Development at Fitzsimons involved the construction of approximately 600,000 square feet of new research space and is the anchor project for the future research efforts at Fitzsimons. The $218M project involved the fabrication and erection of two structural steel buildings, one (9) story and one (12) story building. Additionally the fabrication of two pedestrian bridges was included in this remarkable project. 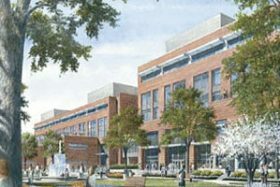 Once completed, the Research Complex 1 will incorporate new research laboratories, core support laboratories, laboratory support space, faculty office and conference space, and a central vivarium. ON-SITE management personnel provided direct management of fabrication inspection personnel of the structural steel associated with this project at (2) manufacturing locations simultaneously located in Missouri and Montana. 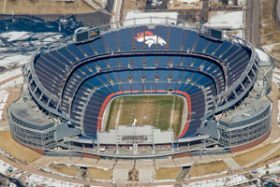 The Investco Field Football Stadium for the Denver Broncos provided unique challenges as the project consisted of numerous manufacturing facilities located throughout the Western Region of the United States. This $384M, 76,000-seat project consisted of the fabrication of some 180,000 tons of structural steel for this project. Due to tight construction schedule the project’s prime fabricator was required to subcontract fabrication operations to over 10 manufacturing facilities working simultaneously. ON-SITE management personnel provided direct management of fabrication inspection personnel of the structural steel associated with this project at manufacturing locations located in Arizona, Utah, California and South Dakota. 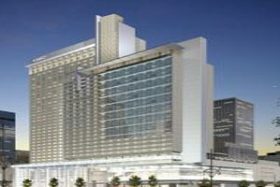 The $349 million Denver Convention Center Hotel has 25,000-square-feet of meeting space, a 30,000-square-foot ballroom, a 15,000-square-foot junior ballroom, a health club, and a 300-seat restaurant, lounge and bar area. The 37-story facility will has a three level, underground parking structure with approximately 600 spaces. ON-SITE management personnel provided direct management of fabrication inspection personnel of the structural steel associated with this project at manufacturing locations located in Oklahoma. The $54 million Harry Bridges Boulevard Buffer is a cable stayed bridge located in the Port of Los Angeles. 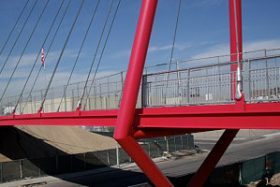 ON-SITE management personnel provided direct management of fabrication inspection personnel of the structural steel, erection and NACE painting associated with four bridges during this project. Manufacturing occurred locations in Lindon Utah with typical duties including monitoring fit-up, welding and performed visual and dimensional inspections of the bridge during manufacturing verifying conformance with AWS D1.5 specifications. ON-SITE personnel supported the fabrication and construction site welding inspection on behalf of the City of Fullerton, grade separation project. Construction activities include elimination of the at-grade railroad crossing on Raymond Avenue to facilitate better traffic flow and increase the safety for vehicular commuters. The initial work has involved storm drain and utility relocations. ON-SITE was responsible for the in plant inspection and construction site support during manufacture and installation of H Pile Steel Beams, verification of rebar, elastomeric bearings, grade separation beams, 60”, 72” RCP Pipe, pre-cast lagging panels and welding inspection during Splicing of Soldier Beam Piles verifying conformance with AWS D1.5 requirements. San Vicente Dam Raise project consists of raising the existing dam that currently stands at 220 feet and can store up to 90,000 acre feet of water. The dam project will increase the height 337 feet and have the ability to store up to 242,000 acre feet of water; more than doubling the capacity of the reservoir and becoming the tallest roller compacted dam in the United States. ON-SITE was responsible for the in plant inspection and construction site support during manufacture and installation of complex structural steel components consisting of 8-2.5 ton each water control gates, hoist equipment, 1-8.5 ton trash racks, 1-14.5 ton bulkhead, 12-7.5 ton each coffer dam components and stainless steel fish screens for this project. ON-SITE performed factory and construction site welding inspection of the complex welded steel gates, trash racks, bulk heads and fish screens associated with the project at locations in NY, AL, MT and CA. Additionally QA oversight during NDE, factory witness testing of the completed units, hoist equipment and HPU units. The Sixth Street Viaduct one of America’s most famous and iconic bridges built in 1932 and spans nearly 3,500 feet across the Los Angeles River. The $449 million project to replace the aging bridge is the largest bridge project in the history of Los Angeles. 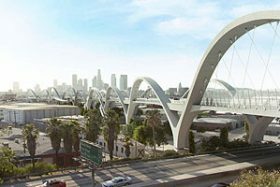 The new Sixth Street Viaduct will consist of a 2,864‐foot‐long network tied‐arch continuous concrete viaduct bridge, along with a 193‐foot-long concrete box girder structure at the west approach. The bridge will carry four lanes of vehicle traffic (two lanes in each direction) and a bicycle/pedestrian path. The project also includes intersection improvements to relieve traffic congestion and the development of local parks, greenbelts, and community features near the bridge. 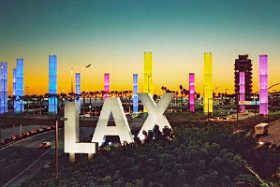 ON-SITE personnel supported the fabrication and construction Quality Assurance inspection of pre-stressed concrete, rebar, and testing services on behalf of the City of Los Angeles.